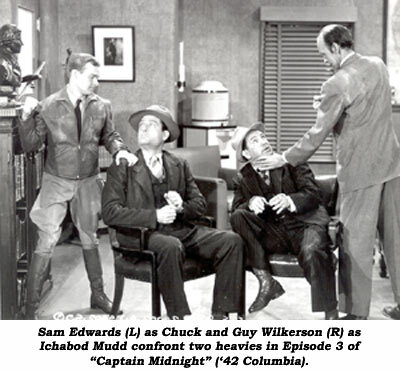 Sam Edwards reflects on his work as Chuck in the Dave O’Brien serial, “Captain Midnight” (Col. ‘42) filmed at the Larry Darmour Studios on Santa Monica Blvd. near Gower. “I had a lot of fun on it. We did 15 episodes in six weeks. I did all of the stunts: the run-throughs, the falling into traps, crashing cars through barricades and so forth, and I was not aware they had a double for me. This little fellow kept following me around and saying, ‘Do you want me to do this for you?’ I said, ‘No, I can drive.’ After the picture, I kept getting extra checks. I found out later I was getting all the stunt checks. This poor guy, I was doing him out of his stunt checks. Anyway, I could use the money because they didn’t pay very much in those days,” Sam laughed. Sam Edwards, 89, died July 28, 2004, of a heart attack in Durango, CO.
With aspirations early in life to be a nun, it was at the dare of school classmates to put on a bathing suit and enter the Miss Chicago contest that changed the direction of life for beautiful Carole Mathews. The girl born Jean Diefel 9/13/20 in Montgomery, IL, (a suburb of Aurora) was now in showbiz. Her entrance into films was under the name Jeanne Francis (“Romance In the Dark”, “Girl From Avenue A”, “Footlight Serenade”). Carole signed with Columbia in late ‘43. “I didn’t like Harry Cohn and he didn’t like me at all. I was more scared of him than anything. He had roughness. Anybody that was rough, I kind of closed up. He didn’t chase me. (As he was known to do.) I didn’t get that far. I was really kind of independent. I liked Max Arno, the talent person at Columbia. I think he was the one that decided to put me under contract. 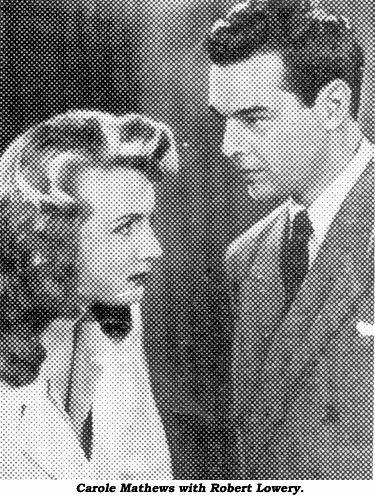 Carole’s early Columbia work includes “Girl In the Case”, “She’s a Sweetheart”, “Missing Juror”, “Blazing the Overland Trail” and “Outlaws of the Rockies” (w/Charles Starrett), “I Love a Mystery” and others…16 films total in ‘44-‘45. 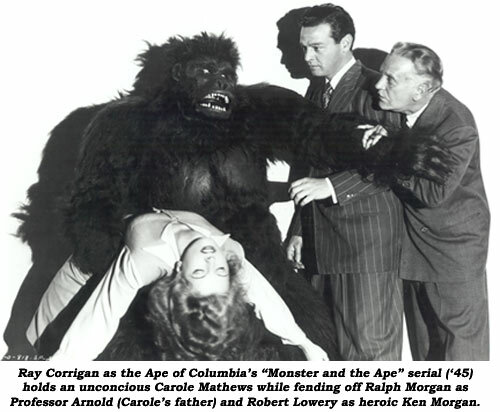 Plus her role as Babs Arnold, Ralph Morgan’s daughter, in Columbia’s 15 chapter “thrill serial of a mechanical monster gone mad”, “The Monster and the Ape” with Robert Lowery. Carole continued to freelance in A and B films and had a regular role on TV’s “The Californians” in 1958. Plagued by various illnesses for years, Carole is once again in good health. “I’m on my third pacemaker. I was ill for about ten years. I had a stroke, I had cancer, I had a new hip replacement. I’m not finished yet. I’ve got some unfinished business to do. I enjoy my life.” In retirement, Carole lives today in Murrieta, California. Viewing the Columbia cliffhanger “Superman” so late in my serial watching career was not unlike finally seeing Lee Powell as “The Lone Ranger” in the Republic chapterplay or catching Barry Nelson as James Bond in an early TV adaptation of “Casino Royale,” both now available on video. 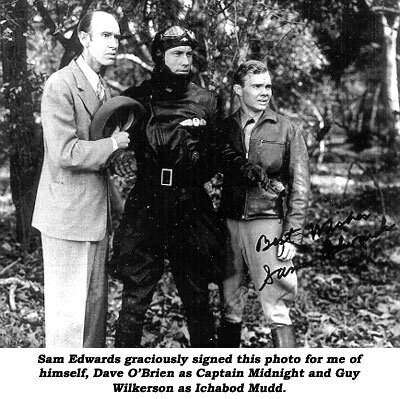 Having grown up on a steady diet of Clayton Moore and Sean Connery in these same roles, their image was simply too strong, too indelibly etched in my mind to allow my being totally fair to their predecessors. The same is even truer in the case of Krypton’s number one son. 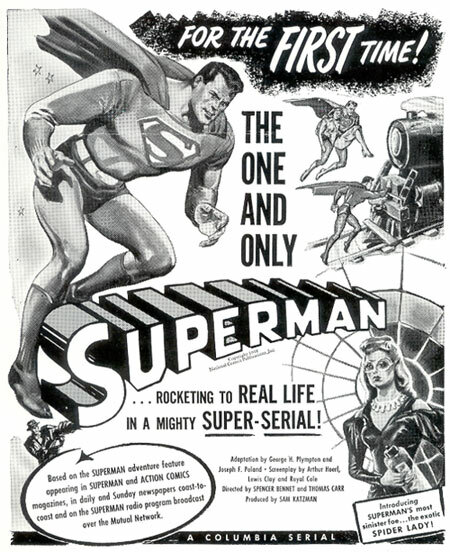 For the million other Baby Boomers who sat mesmerized in front of their black and white TVs in the early ‘50s, there will always be only one genuine Superman, George Reeves. Other actors might have borrowed the famous red and blue costume on occasion, people like Christopher Reeve and Dean Cain, but in the minds of millions—myself included—only George Reeves was the real thing. For this reason, I had to do some serious mental preparation in order to watch the Columbia serial and not unduly pre-judge it or allow small unflattering comparisons to the beloved TV show to cloud my opinion. This wasn’t often easy. To be fair, this is not quite the incredibly inept, bottom of the barrel serial I had—thanks to years of negative comments from many quarters—braced myself for (unlike “Batman and Robin” which pretty much lived up to grim expectations). It is indeed cheaply produced with the usual Sam Katzman corner cutting, inadequately crafted and not always expertly paced, but still I had a pretty good time with it. It’s played very broadly—even by serial standards—but for the most part this is okay. After awhile, even Superman’s live action leaps into the sky which instantly turned into cartoon representations of the soaring character didn’t bother me as much as I thought they might have. Given the myriad of acrobatic things the writers expected him to accomplish in flight, there was simply no other way to economically do it. The Captain Marvel and Rocketman dummies at Republic propelled over a line looked great for what they did, but their motion was severely limited and could never have emulated the sort of arobatics Superman’s travels were intended to depict. 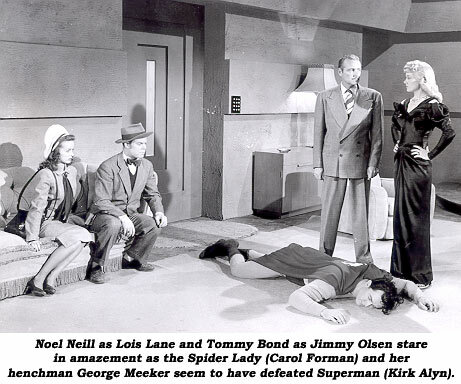 Plotwise, once Superman gets to Earth (the first chapter predictably recounts his origins on the doomed planet Krypton), he finds work as Clark Kent at the Daily Planet and is soon battling a gang led by evil femme fatale the Spider Lady (played by lovely serial veteran Carol Forman who, for some reason, wears a God-awful blonde wig through most of the proceedings). Ms. Neill, with her long hair, appears a good deal younger here, more collegiate and preppy. The fact she sports a hat which looks something like an enlarged slice of pita bread, doesn’t help her rather bratty image. She’s a bit spunkier and more confrontational than when she played the character on the small screen and doesn’t for an instant relinquish her intense dislike of Clark Kent, a dislike which seems more to border on loathing than merely professional rivalry (apparently the actress felt pretty much the same way about the actor in real life). The late Kirk Alyn, not unexpectedly, is my real problem—just as I thought he would be—so let me get this major gripe out of the way then move on. It seems to me there are two ways to play Superman. 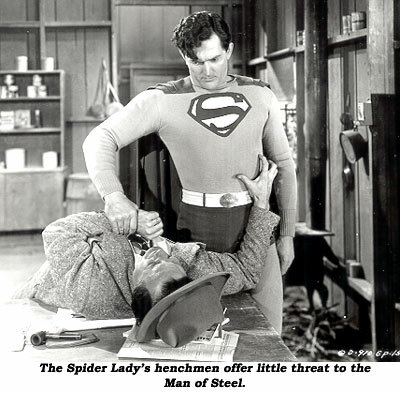 George Reeves, due to the different styles and approaches of his TV producers, Robert Maxwell and Whitney Ellsworth, had a go at both: stoic, taciturn and no-nonsense crimefighter (first season) and later avuncular, caring, wise but powerful protector of the weak and needful for the remainder of the show’s run. Alyn, however, ignores both of these roads. His interpretation is highly exaggerated, almost arrogant, something no serial hero should ever be. The way he postures and poses reminds me of all those strutting, gleeful musclemen who played the role of Hercules after the more subdued Steve Reeves vacated the part. He struts about, puffs out the “S” on his chest, grins too much, and comes off as more bully than savior—and not a very bright one at that. Perhaps directors Thomas Carr and Spencer Bennet, as well as writer George Plympton, had a hand in this. Perhaps no thought to subtlety was given when bringing this comic book character to the big screen. (One has to wonder how Republic, who had first rights to the character, would have envisioned the part). As said in an earlier column, I have enjoyed Alyn in other roles where his performance wasn’t so exaggerated or over the top (“Daughter of Don Q” as an example). But in this instance, I found him nothing short of annoying and a real turnoff. Most of the time I rooted for the bad guys! Speaking of the heavies, the supporting cast is the usual Columbia gang of thugs and stupid henchman, not only old pros like Jack Ingram, Charles King, George Meeker and Terry Frost, but one-time serial good guy CharlesQuigley as a villain this time around, none of whom, to be honest, appear much up to the task of offering a serious threat to the Man of Steel (actually, in this version I’m not so certain about the steel part since the villains never seem to hurt their mitts when they punch out Clark Kent). What’s needed here is a bigger than life villain (which the Spider Lady is assuredly not), a more dynamic storyline and some better cliffhangers. 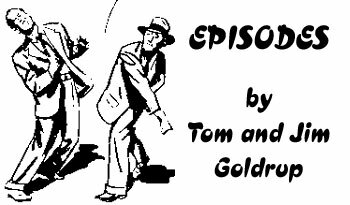 I know this serial was popular and financially successful at the time and it prompted a sequel, the slightly more enjoyable “Atom Man Vs. Superman”(‘51), but for the most part, viewed nearly a half a century later, I couldn’t help finding it, unlike so many of the classic serials I still very much enjoy, a rather tame, bland and not particularly satisfying experience. It didn’t annoy or necessarily bore me…and there were actually moments I found myself enjoying… it’s just that there weren’t enough of them to support a storyline built around a character as normally exciting and mythical as the mighty Superman.